Camps for Kids at Emerald City Gym | Where Fun Meets Fitness! Are you looking for a fun winter or summer activity to keep your child active during the break? Send them to Emerald City Gym’s camps! Our camps offer kids throughout Kansas City the opportunity to learn basic gymnastics skills, participate in crafts and activities while making new friends. 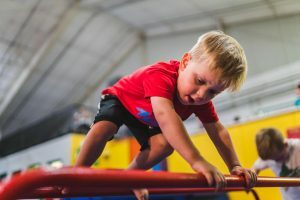 Our 18,000 sq ft gym houses both boys and girls gymnastics equipment, a 5,000 sq ft rock wall, and other play equipment including trampolines, rope swings, slides, tunnels, a maze, a zip line, slam-dunk basketball, and more!